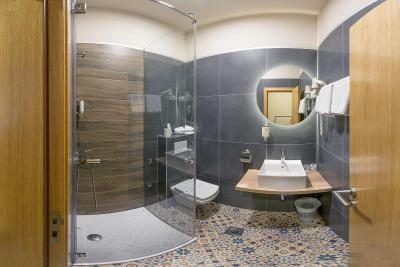 Lock in a great price for Hotel St. Georgije – rated 8.2 by recent guests! Excellent staff. Walking distance to center and a very big shopping mall. Room was spacious and clean. Breakfast was good. Location was good once we worked out where everything was. Staff were friendly and helpful. Supermarket was a short walk away. The location is central to visit the castel, mosque and the main street and the riverside. Some people speak english and they do their best to help you for example calling a tax, give you directions. Nice rooms, very clean and comfortable. Everything is new and very nice equipped. A very nice and cosy small hotel, with very friendly staff and a pleasant atmosphere. Location is perfect, just about 10 minutes from the city centre. And also, great value for money! Definitely my recommendation when visiting Banja Luka. Good value for your money. Nice breakfast. Helpful personnel. 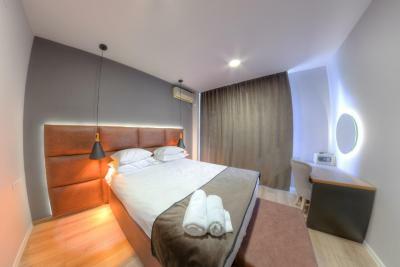 Hotel St. Georgije This rating is a reflection of how the property compares to the industry standard when it comes to price, facilities and services available. It's based on a self-evaluation by the property. Use this rating to help choose your stay! One of our best sellers in Banja Luka! Hotel St.Georgije is centrally located in historic Banja Luka, 0.6 mi away from the city’s theater. Massage services are available to guests and the hotel has a terrace and a garden. 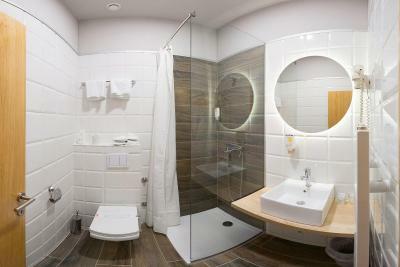 Rooms at Hotel St.Georgije have air conditioning, stylish, modern décor and hard wood floors. A mini bar and TV with satellite channels are provided. 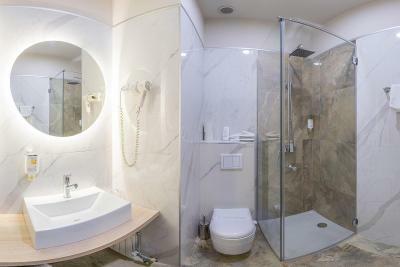 All rooms have a private bathroom with a shower. A buffet breakfast is served daily. The hotel also has dry cleaning, laundry and ironing facilities, and a 24-hour front desk. There is Wi-Fi available free of charge throughout the hotel. A coffee bar is located on site. Banja Lukas’ medieval castle, which is located on the left bank of the Vrbas River, is a 5-minute drive from the hotel. The tree-lined Vrbas River can be reached on foot in 5 minutes. When would you like to stay at Hotel St. Georgije? 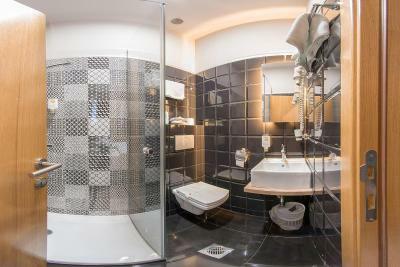 Air-conditioned room featuring a seating area, a TV and a private bathroom with shower. 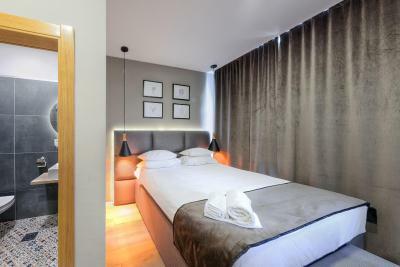 Hotel St. Georgie is a modern and nicely appointed Banja Luka hotel that welcomes business travelers as well as visitors on holiday with friends and loved ones. 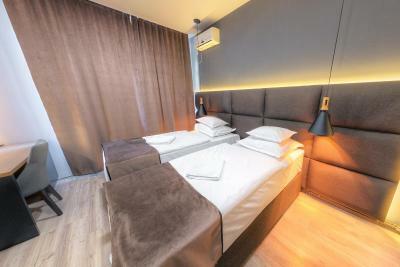 If you are looking for quality accommodations in Banja Luka, then look no further than Hotel St. Georgie. 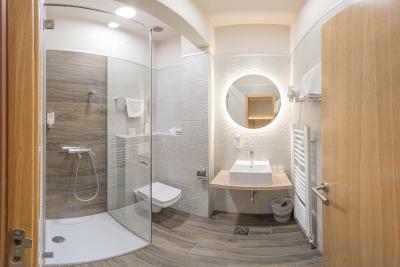 Centrally located in Banja Luka, close to transit and near the college and medical clinic, Hotel St. Georgie will ensure your stay is as pleasant as possible. Guests are welcome to take advantage of the complimentary breakfast served in the restaurant with friendly staff and a welcoming atmosphere. The reception desk at Hotel St. Georgie is available 24 hours a day to take care of all of your needs and free parking in the on-site facilities is available in addition to wireless Internet access. All of Banja Luka’s must-see attractions, historic sites, and cultural centers are within easy reach of the Hotel St. Georgie. House Rules Hotel St. Georgije takes special requests – add in the next step! Hotel St. Georgije accepts these cards and reserves the right to temporarily hold an amount prior to arrival. We got very old room, though new one was shown when booking. the pictures and the way they showed the hotel and the value for Bosnian standards, were far different than reality there. The breakfast was poor. It was a bit cold in the breakfast room. The bathroom was clean but very small!! Not a problem for us but its located on a very busy street so not perfect for children and next to a gas station. The hotel is right next to main street, so it is very loud if you get the room next to the street. The breakfast is very very poor unfortunately, Don't expect to much. Friendly stuff, parking provided, free WiFi. Position directly on highway and between two working gas stations. Everything was OK, room very spatious. Good location, excellent staff. Nice and tidy.